We know that some people are particular about starting Christmas celebrations or even mentioning Christmas too early. Others, of course, would celebrate it all year round. Now, as we hold our meetings on the 1st Saturday of the month, and the 1st Saturday of December is on the 1st, hopefully we can be forgiven for celebrating Christmas at the December meeting on the 1st of December. Lots and lots going on that day. Hopefully you’ve remembered our Christmas Challenge. Every year, NIPG members demonstrate their imagination, talent and hard work. with this year’s challenge, we are exciting to see what you bring. Here’s quite a complex pattern, but it’s a bit different. Just search YouTube or Pinterest and you’ll find much more straightforward patterns, which shouldn’t take too long – just in case you haven’t remembered to make one. Here’s a message from our Chair, Paula to give you a small indication of what’s happening on Saturday. Did we mention that you should bring your mug with you? Although we have four weeks to Christmas this is our Christmas meeting . Please bring you own cup/mug !! We will have a floral demonstration and if you purchase a ballot ticket – three lucky members will take home one each of the arrangements. The ballot will cost £2 and will pay for the flowers. Please all bring along your ‘make and take bottle bag‘ . They will all be displayed, afterwards you will be given a bag to take home -not your own . We will have tea coffee and eats provided by our catering ladies, a big thanks to them for all their hard work. Adrienne will be collecting all the money for Glenada*, see below for prices and more information. If you can bring change, this will help Adrienne greatly, as trying to get the right change can be time consuming. Kaffe Fassete tickets – there are still a few available, for the talk in the Ulster museum so please get yours and save disappointment . Workshops – Mary Walker will have the requirements listing for oa great workshop being held in February – confetti patchwork. Actually you probably have all the requirements in your stash. I visited the exhibition last Saturday with Clare and we both were impressed with the venue and the work. P.S. Did I mention that you should bring your own mug/cup? Glenada* – the yearly trip to Glenada in Newcastle, where we sew, sew, sew and sewialise and have great fun. It’s the perfect way to get to know your fellow NIPG members. Bring whatever you like to sew – hand or machine and yes, you may bring your own refreshments. Every year without fail and working quietly in the background, Adrienne organises and collect the money for Glenada. This year is no exception and she has worked hard to get these reasonable prices. Weekend Rate – includes meals and use of room for sewing. It would be great if you could have the correct money for Adrienne, either cash or cheques. Thank you. On 26th June, I received an email from the Guild asking for volunteers to hand embroider a “very important piece – fabulous fabric – specially made” at the Ulster Folk and Transport Museum, that had to be finished by 10 July 2017, with the unveiling of the project on 17 July. I liked the sound of it! So I signed up for it. What a surprise – it was a huge tapestry specially woven for the latest series of The Game of Thrones! And it was gorgeous! And very, very bloodthirsty! We were all sworn to secrecy. And we kept our word. Not a single leak! My husband became more and more curious as the days went on. I didn’t tell him what I had been doing, until the Mail and the Sun broke the news on-line the night before the media launch. The tapestry had been specially woven and our job was to highlight various parts of it, generally hair and clothing, with the blood, crowns, sword hilts etc being highlighted in metallic thread (a nightmare to sew!) to make them stand out even more from the background. I was very proud of my “hair embroidery”, and even more proud of embellishing the zombies’ clothing to make it look even more decayed. Not often one is asked to do that! There were four of us from the Guild and others from the other Craft Guilds, around 30 volunteers in all. We worked well together, with quiet conversations going on all round. The constant supply of Tunnocks Tea Cakes greatly helped! 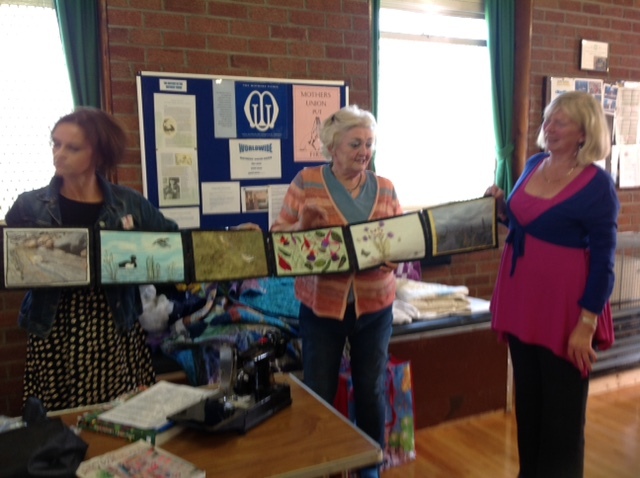 The tapestry came to us in 6 panels, as they came off the looms. Each panel represented one series, with an illustration of each episode woven into it. The last panel was very late indeed, arriving on 13th July. With the media-launch scheduled for 17th, we were working as fast as we could. It also meant that I didn’t get to embellish the ‘decaying flesh’ I had been asked to do, and for which there was a specific colour of thread! Each panel – about 35 feet long – was laid out on a long run of work tables, and a number of us worked on each panel simultaneously. As well as the embroidery and embellishing, we needed to sew Velcro to the back of the tapestry so that it could be hung. Once I got into a rhythm with this, I reckoned to herringbone Velcro at a rate of 5 feet per hour. Others were faster! The gallery we were working in was closed to the public “for routine maintenance”. I did rather wonder what visitors to the Museum made of the groups of ladies coming and going to carry out the “Maintenance”! We were given a preview of the tapestry in the Ulster Museum immediately after the media launch. My word, it was impressive! And the really interesting thing is – it is a work in progress. Each episode of the current series will be woven and sent to the Museum for embellishing and hanging along with the rest of the tapestry. Our incoming Treasurer, Jayne McClenaghan was lucky enough to work on the first episode. I have really enjoyed the experience. It was exciting, interesting and varied work. I met new people, which is always good, and in short, I had a ball! I’m looking forward to working on it some more. My friends and my younger relatives are so impressed! Important words from Brenda. May Meeting is at St Dorothea’s. Spring is well and truly here with lots of blossom and buds on the trees. As usual doors open at 10.00 a.m. with tea & coffee. The speaker is Pauline Openneer from Donegal whose talk is entitled “Tweeds and More”. Sundays workshop is in the Museum as usual, where we shall be making a Caroline Bag. You can make the bag in any fabric you like. 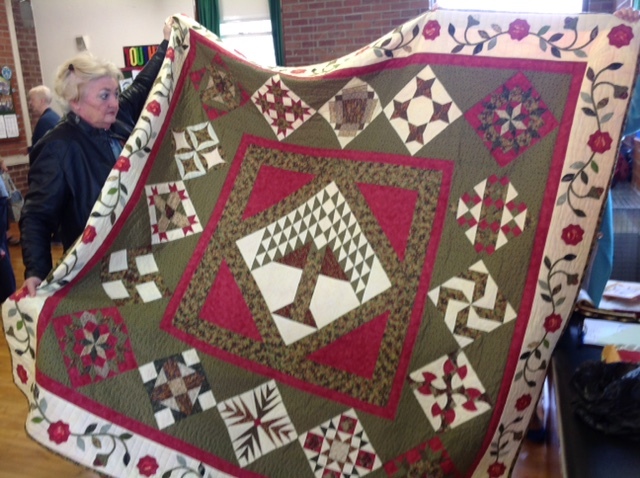 The last workshop of this quilting year is on Friday 12 May in Orangefield Presbyterian Church, Castlereagh Road from 10.00 a.m. to 4.00 p.m. 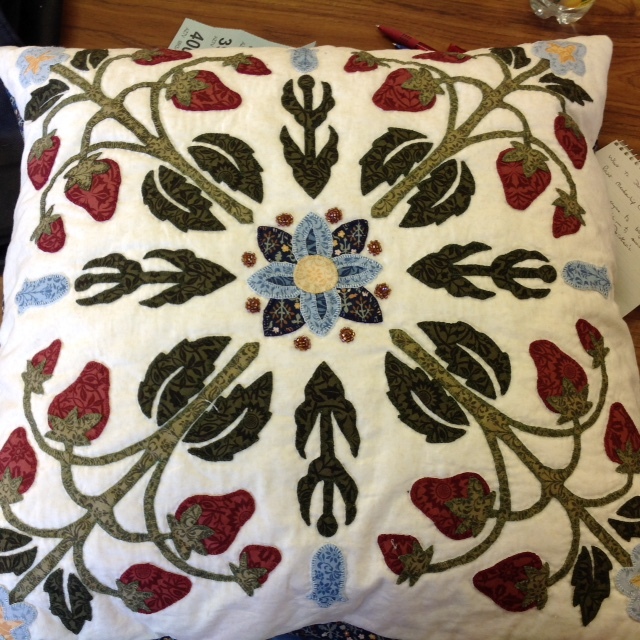 The tutor is our own Valerie McKeown, and she will be teaching us to make a Dragonfly Cushion. I think there are still a couple of places left. The June meeting is our AGM and I am hoping that we will get some names for committee as there are 4 vacancies. If you are willing to serve please speak to me or a committee member at next Saturdays meeting. We have to date 154 Cuddlies, well over the target of 100 for the Neonatal Unit at the Royal Maternity Hospital. If any one has any more please bring them on Saturday as I would like to hand them over at the A.G.M. Hope to see you all on Saturday. Looking forward to the Stack ‘n Whack workshop being given by Ann Blachford on Friday 18th November. Our next meeting is on Saturday 3rd December. Please get in touch if you’re interested in joining us for the first time. Also, we’ve changed the menu somewhat. Home is still home, but we’ve added a section about ‘Hands Across the Border‘ and would love to hear how you’re getting on. Another new section is ‘Current Projects’. Find out what Brenda has chosen for her Charity this year. Get the pattern for the Cuddly blanket, a project for the babies in the Neonatal Intensive Care Unit. This is a wonderful project instigated by our Chair, Brenda Richardson to give back to the Community. Please get in touch if you have anything you’d like to add, suggest etc. Would love to hear from you. Almost time to meet up again for our 2016 – 17 season. Here’s a message from our Chair, Brenda Richardson. Well the summer is almost over and I noticed the other day that the nights are also drawing in. I hope you have all had a good summer and got lots of sewing done. The new Guild year starts on Saturday 3rd September in the Parochial Hall at the Ulster Folk and Transport Museum. Following some of last year’s comments, the committee have decided to have an earlier start to our meetings. Doors open 10.00 a.m. and the meeting will start at 10.45a.m. with the speaker being introduced at 11.00 a.m.
Angela McCormick and Patricia Pauley will talk about helping with the Belfast WAVE quilt. There will be the ever popular Show and Tell, so please bring along your new work to show. We will be presenting a cheque to Quaker Cottage in respect of last year’s charity collection. You will hear about the workshops up until Christmas. Don’t forget to bring your cup and wear your name badge. If you haven’t already made one you have a few days before the meeting! NB This form is an image, so you can’t complete it online. However, you can print it. Using the right click on your mouse select, “Save Image as”…. whatever you like. Current members will have received the form in the email which Brenda has sent everyone. If you haven’t got that email, or if you have a question, please get in touch. An exciting announcement was made at our AGM, Joy McCormick’s grandson, Patrick Huston had just been selected to represent Team GB in Archery at Rio 2016 Olympic Games. Click here for a BBC interview with Patrick made just after he had qualified for Rio, in which Patrick describes his achievement as ‘amazing’. He also admits to being a bit of a “show off”. However, we think that he’s entitled to be that and more. As if being three time world champion archer at junior level wasn’t enough, he’s a former Festival of Quilts prize winner, ca 2006. “In his younger days he enjoyed sewing – was quite good on the sewing machine. 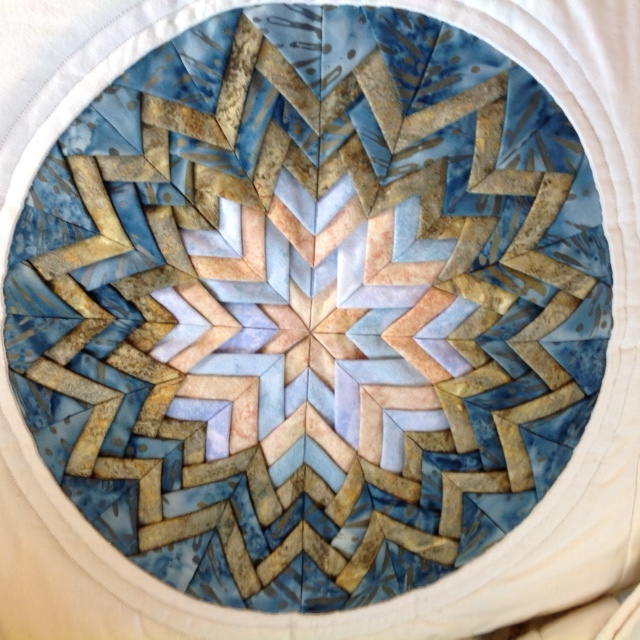 I am attaching two photos of a quilt he and I worked on together which was exhibited at the NIPG summer exhibition at the Folk Museum, in the days when they used to mount a craft exhibition. Patrick aged 7 concentrating on his quilting. One is of young Patrick hand- piecing the quilt. The other is of the quilt hanging at Cultra with him, his older brother and myself. I see by my PC they are dated 2003, so Patrick would have been 7. I believe it was in 2006, when he turned 10 that he made a small wall-hanging which I put into the junior competition at the Festival of Quilts in Birmingham. The topic was “The Northwest Passage”. Patrick created his hanging out of re-cycled materials. It won second prize. 2006 Patrick Huston (aged 10) 2nd Prize, Festival of Quilts Birmingham. Made from recycled materials. Patrick came home to see his parents just after our AGM, as he trains full-time in England. I told him I had mentioned his early career as a quilter at the Patchwork Guild. He was really amused to hear his achievements had been mentioned at the NIPG meeting and laughed. In fact he was trying to bully me into making him an “Olympic” quilt to celebrate his getting an Olympic place. “Yesterday (Wednesday 29th June), he was kitted out with his Stella McCartney designer gear to wear in Rio. Three suitcases full! This photo is hot off the press” Joy McCormick, June 2016. Patrick, we’ll all be glued to the television, supporting you and willing you on. Most importantly, enjoy every second of the experience. Here’s a wee bit about the sport of archery, taken from the official Rio spectator guide. Considering that hunting is an activity strongly connected to the beginning of our civilisation, archery can be considered one of the oldest sports in history. The practice was made official in the 16th century with the organisation of tournaments in England. Its debut in the Olympic programme was in Paris 1900. In St. Louis 1904, the sport became one of the first to allow women to participate. ABOUT THE COMPETITION The distance between the archer and the target (1.22m of diameter) is 70m. The target score varies from 1 to 10, according to the proximity to the inner circle. The archer has 40 seconds to shoot each of their six arrows. In the finals, the archer has 20 seconds to shoot each of their three arrows. In the air, the arrow can travel at more than 240km per hour. In the knockout system, any mistake can rule the athlete out of the competition. In individual events, archers with the best results after five series of three arrows go through to the next phase. The same rule applies to team events, but the best teams after four series of six arrows go through. 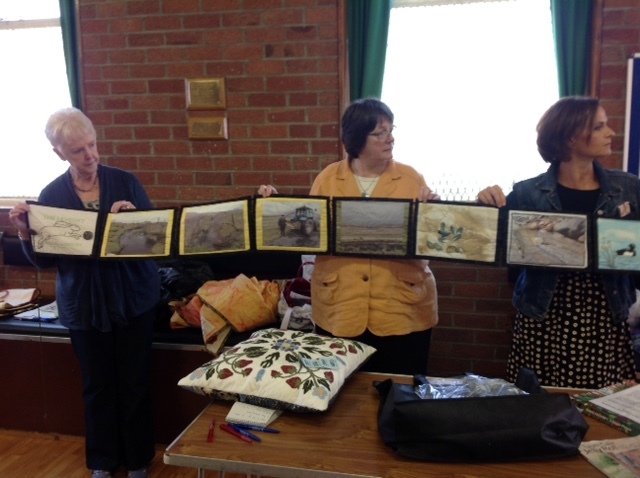 Report from Jayne McClenaghan on Gail Lawther’s Workshop. Delighted to have Jayne’s permission to link to her blog post on the NIPG Gail Lawther workshop. Jayne is doing her City and Guilds Part 2, in which she has to study designers, so it was a happy coincidence that the Guild had invited Gail. Jayne is also an accomplished artist and is constantly adding to her range of craft skills. Her posts are really interesting and how could you not fall in love with Smudge? Really appreciate this posting Jayne, but would be equally delighted with any other additions to the Gail Lawther workshop in the form of photographs or comments from those who attended the workshops/talk. If you have any, please send them to us. Open the box and out pops a sewing machine! Last year we opened our 2014-15 season with our very own members. Our Guild is packed with industrious and talented people and we wanted an opportunity to highlight some of our members’ pieces. We left it entirely up to each speaker as to what they want to ‘share’ within a ten to fifteen minute slot. 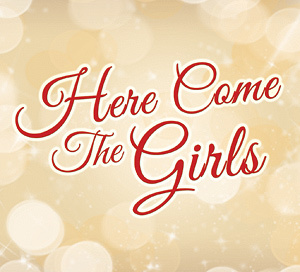 ‘Here come the girls’, this year’s theme…. intriguing! Last year it was “Favourite Things”. The four people who stepped up were Esme Edwards, Anne James, Paula Ellis and Helen Heron. It was absolutely fantastic, one of our best meetings! Esme Edward’s Treasured Machine with the Magical Box in the background. Esme Edwards, began by placing a funny wee black box on the table, puzzling us all at what it contained. What was her favourite thing? Having started her talk by revealing some of her history with sewing and in particular patchwork, we were wondering what could be in this little box. 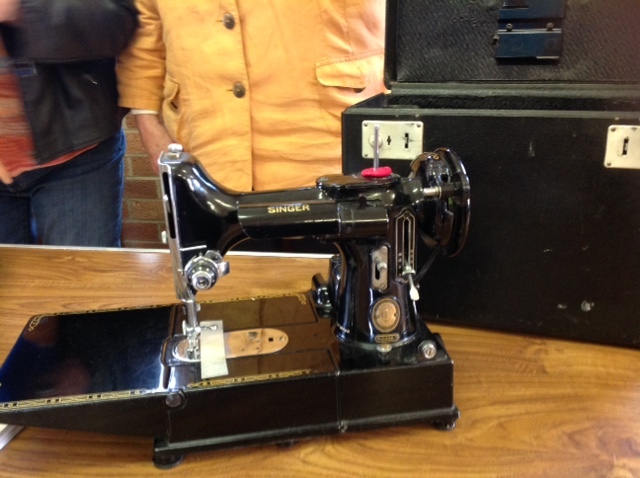 To our delight, she opened the box to reveal the most gorgeous sewing machine. One which she has until recently, used regularly. How to follow Esme’s opening? 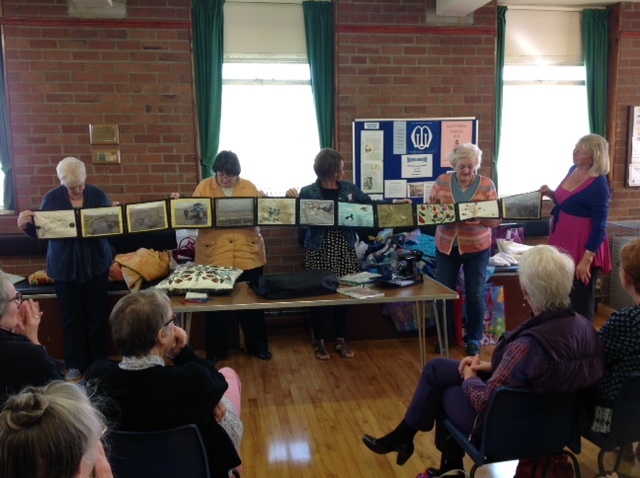 Anne James, our present Chairperson, bravely stood forth and enchanted everyone with her manipulated fabric piece, which she had constructed for her City and Guilds. 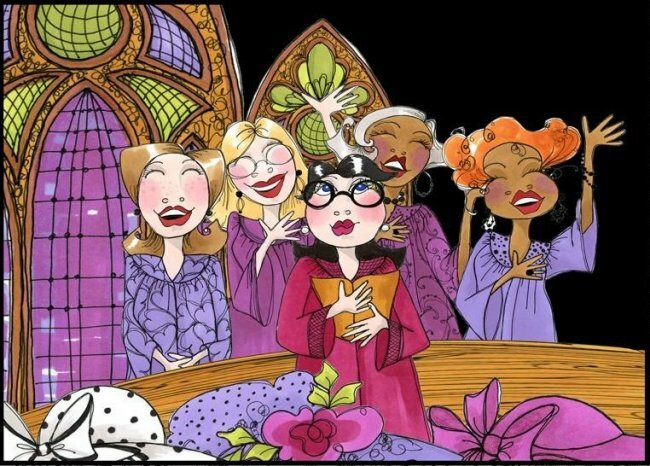 We were on a roll – how could our meeting get any better? 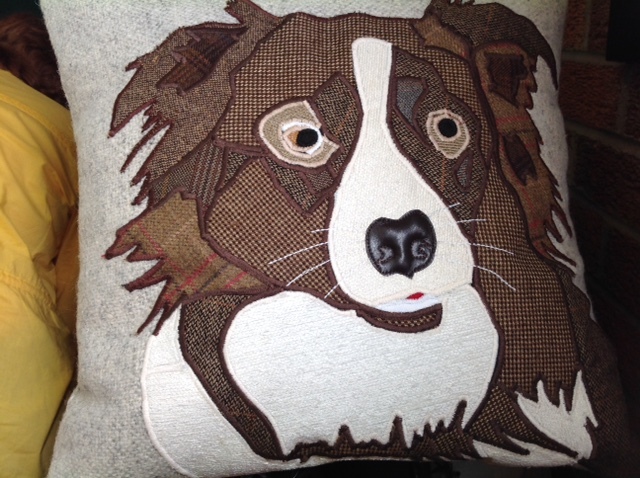 Paula Ellis’s Cushion, depicting Lucky, a special commission. However, Paula Ellis captivated everyone before she even spoke with her gorgeous cushions. The variety and skill which she used to create them, had everyone listening to every word and trying to take it all in to replicate at home. The cushion which had been commissioned by proud pet owners, was beautiful. [After the meeting there were demands that Paula give us a workshop on creating these adorable cushions. Paula is taking an all day workshop on Sunday 8th November. 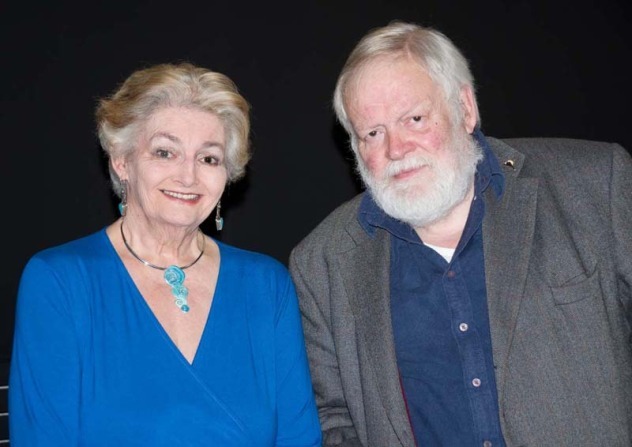 Helen Heron and Michael Longley at the Linen Hall Library for the launch of Helen’s exhibition. Lastly, and by no means least, Helen Heron treated everyone to a riveting talk, on how she came to create her piece which celebrating renowned poet, Michael Longley’s poem ‘The Leveret’ written for his grandson. Helen Heron’s piece based on Michael Longley’s ‘The Leveret’. That was a glimpse into last year…. This year is a mystery, so you’ve got to be there to experience it.